A typical Indian wedding includes many religious ceremonies, festivities, dressing up and socializing, and is, undoubtedly, one of the most lavish and colourful events of your life. 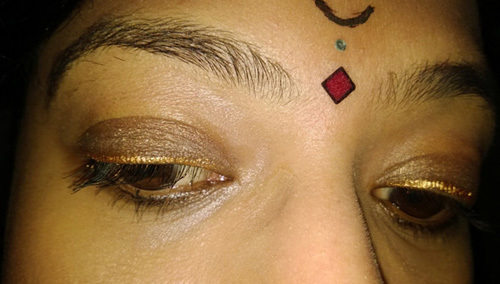 A Maharashtrian bride is identified by her nose ring and a half-moon like bindi. She looks gorgeous and graceful in her traditional outfit and gold jewellery. A Maharashtrian wedding also requires the bride to wear lots of glass bangles, while usually keeping the makeup simple, yet elegant. 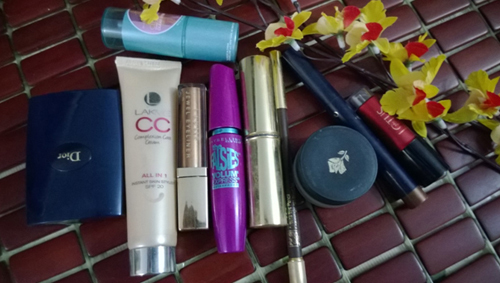 And that is why a Maharastrian bride makeup routine isn’t all that easy! Begin by cleaning your skin with a cleanser. Hydrate the skin properly so that it’s not dry, as any makeup applied to dry skin may look cakey. If you are blessed with good skin, you can skip the concealer and instead go for a tinted moisturizer. 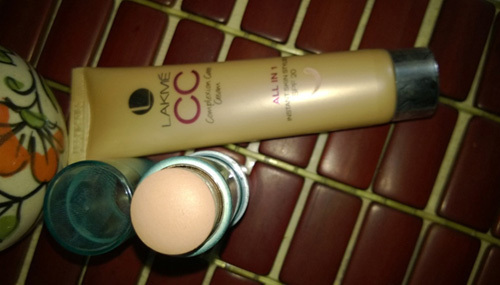 I have used the Lakme CC Cream to even out my skin. To make it look a little brighter, I followed up with the Maybelline BB Stick to cover my blemishes. Now set your face makeup with a powder. This is an important step that will help your makeup stay on for a longer period of time. The powder gives you a matte complexion that will not wear off easily. I have created a special look for the eyes in this tutorial as I wanted it to be a little different from the regular eye makeup. 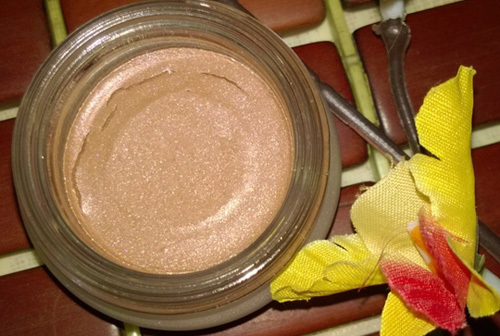 Start by applying a shimmery copper cream eye shadow on the entire lid and extend up to the crease. Blend it with a blending brush as the colour should look subtle. I used a cream eye shadow stick from Estee Lauder. Fill your lower lash line with a black kajal. Apply a thin line of golden liner on the upper lash line. If you don’t have a gold eye liner, take some golden shimmery shadow and use a thin angled brush to draw the line. This should be the highlight of your eye look. Finish your eye makeup by applying some curling mascara on the lashes. It is best to apply a few coats to make the effect more intense. Make sure that any shadow or liner particles are dusted off with a puff. Use a fluffy brush, as it will give an even tone to your face. For the cheek makeup, I have used an apricot cream blush to define my cheeks. It is best to define your cheeks before applying the blush. This will make the cheek bones look prominent and contoured. Take a shimmery peachy-pink blush. I always try to use cream or mousse based blushes when I am doing any gorgeous makeup look. This creates an illuminating effect and looks good under strong lights. I have used a mousse blush from Lancôme for this look. The final step is to put on a lip colour. As I wanted to keep the look quite simple I selected a light mauve shade for my lips. The blue undertones of lavender or light mauves can generally appear quite washed out on Indian complexions. However, since I have used a lot of gold for my face and eye makeup, the lip colour complemented the entire look. 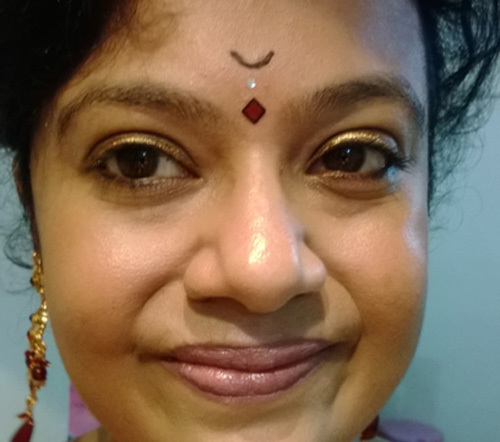 To stick to a traditional Maharashtrian wedding look, I opted for a simple motif of a half-moon with the help of a black liner. I followed it up by applying a black-maroon bindi below it. Copper and gold hues suit the Indian skin tone really well. Most Indians have warm undertones and using gold pigments can enhance their beauty. Try and use makeup products with shades of gold in them, to enhance your look and make it stand out. This look on a Maharastrian bride in yellow saree will be stunning at the very least!